Humeomics is a sequential step-wise chemical fractionation that simplifies the complex matrix of a humic acid (HA) and weakens its supramolecular interactions, thereby allowing a detailed characterization of the involved molecules. A recalcitrant residual end product of Humeomics, namely RES4, was successfully solubilized here in alkaline conditions and subjected to a semi-preparative high-performance size exclusion chromatography (HPSEC). The resulting six size fractions separated by HPSEC were analyzed by different NMR techniques. 1D 1H-NMR spectra did not reveal significant molecular differences among size fractions, although all of them differed from the spectrum of the bulk RES4 especially in signal intensity for aliphatic materials, which were assigned by 2D NMR to lipidic structures. Diffusion-ordered spectroscopy (DOSY)-NMR spectra showed that the homogeneity of RES4 was significantly changed by the HPSEC separation. In fact, nominally large size fractions, rich in lipidic signals, had significantly lower and almost constant diffusivity, due to stable supramolecular associations promoted by hydrophobic interactions among alkyl chains. Conversely, diffusivity is gradually increased with the content of aromatic and hydroxyaliphatic signals, which accompanied the reduction of fractions sizes and was related to smaller superstructures. This study not only confirmed the occurrence of supramolecular structures in the recalcitrant humic residue of Humeomics, but also highlighted that more homogeneous size fractions were more easily characterized by NMR spectroscopy. Humic substances (HS) are naturally occurring organic substances ubiquitously found in the environment , bearing properties of environmental and physical-chemical significance. Their recalcitrance, either against enzyme activity or oxidative stress, is an intrinsic property of HS and plays a pivotal role in long-term storage of organic carbon in soils and subsequently in neutralization of humic-bound pollutants. Outdated theories attributed HS recalcitrance to their nature of large macromolecules formed over a long time by unclearly defined humification processes. According to this hypothesis, the number of covalent bonds of a macromolecular structure would prevent microbial and chemical degradation, resulting in recalcitrance. Recent experimental evidence  overruled this theory by showing that HS were better described as small heterogeneous molecules held together by mainly hydrophobic and H-bonding forces in supramolecular associations. This novel understanding of humic chemistry attributed recalcitrance to the tight association of single small molecules into hydrophobic domains separated from water and degrading microbes and oxygen. A chemically resistant organic matter has been estimated to reach about 11% to 18% of total carbon in some soils . Characterization of refractory organic matter was attempted by 13C isotope analysis , and chemical resistance was associated with alkyl structures. The reason for accumulation of alkyl organic matter in soils was attributed to the presence of plant-derived biopolymers cutin and suberin . Other investigations indicated that aromatic compounds with single- or polycondensed ring also play a role in the recalcitrance of organic matter in soil . Despite the recalcitrance attributed to aromatic rings in polycondensed materials, both lignin derivatives  and charcoal  were found to be functionalized and, in fact, degraded over time by soil microbial activity. Based on 13C isotopic dilution in organic matter extracts and their 13C-cross polarization magic angle spinning (CPMAS)-NMR spectra, a preferential decrease of hydrophobicity was assessed when passing from forested to cultivated soil, thereby substantiating that accumulation of organic matter in soil proceeded by stabilization of hydrophobic molecular associations ,. Moreover, Pedersen et al. found evidence by 13C-CPMAS-NMR that hydrophobic aliphatic and aromatic organic molecules could resist degradation in drained thaw-lake basins, thus constituting the largest part of recalcitrant organic matter. An alternative to application of CPMAS-NMR to solid recalcitrant humic material may be based on the solubilization of humic molecules in more homogeneous and simpler fractions and, thus, favoring a more detailed evaluation by NMR in the solution state. A recently introduced chemical and chromatographic fractionation called ‘Humeomics’ , allowed the separation of the bulk ‘Humeome’ matrix into homogeneous fractions by a step-wise breaking of chemical bonds of increasing strength, except carbon-carbon bonds. An end result of this procedure was a residue composed of unextractable organic material. The aim of this work consisted in characterizing, by mono- and bidimensional liquid-state NMR techniques, the molecular composition of such a refractory end product of a humic acid subjected to Humeomics and further separated in size fractions by preparative HPSEC chromatography. All reagents were provided by Sigma-Aldrich with 99.9% purity. A humic acid (HA) was isolated from a volcanic soil (Allic Fulvudand) at Vico, near Rome (Italy), and purified as described elsewhere . This HA was then submitted to a step-wise series of solvolyses and chemical fractionations defined as Humeomics ,. Briefly, the procedure consisted in multiple fractionation steps, which separated either unbound or ester-bound molecules from the humic matrix, and cleaved, in the final step, alkyl-alkyl and alkyl-aryl ether bonds with an aqueous HI treatment. The resulting solid residue (defined as RES4) , was extensively washed with Milli-Q deionized water (Millipore, Billerica, MA, USA) until iodide-free and freeze-dried. The solid freeze-dried residue was suspended in water and dissolved with a 0.50 M NaOH solution by automatically titrating under N2 to pH 7.2 (VIT 909 21 Videotitrator, Radiometer, Copenhagen) until pH remained constant for 120 min. A final concentration of 0.20 g L−1 was obtained. Possible microbial growth was prevented by adding 0.3 g L−1 NaN3. This solution was then filtered through a 1 μm glass microfiber filter (Whatman GF/C, Sigma-Aldrich, St. Louis, MO, USA) and kept refrigerated under N2 atmosphere, until subjected to preparative high-performance size exclusion chromatography (HPSEC). The RES4 solution was eluted through a Phenomenex Biosep SEC-S-2000 column (Phenomenex, Torrance, CA, USA) (21.2-mm diameter × 300-mm length) and precolumn (21.2-mm diameter × 78-mm length). A Gilson 305 pump, a Gilson auto-sampler model 231 equipped with a 5.0-mL loop, a Gilson FC205 fraction collector, and a Gilson 116 UV detector set at 280 nm were used to automatically and continuously separate humic fractions (Gilson, Inc., Middleton, WI, USA). Chromatographic runs and profiles were monitored with a Gilson Unipoint software. A mobile phase consisting of aqueous (Milli-Q Millipore deionized water) 0.3 g L−1 NaN3, 0.01 M AcONa, and 3.5 mM of NaH2PO4/Na2HPO4 buffer solution at pH 7.0 was eluted through columns at a flow of 1.5 mL min−1. The auto-sampler was loaded with 20-mL flasks, each filled with 16 mL of RES4 and used for three injections. Approximately 50 mg of RES4 were injected and, after 25 min from injection, six fractions were collected. In detail, five fractions for 5 min each and a sixth fraction comprising a final elution for 15 min were isolated to collect 83.8% of bulk material. However, the sixth fraction was collected after a longer elution time with the aim to cumulate a sufficient amount of humic material for good-quality NMR analysis (>5 mg). For the same reason, the remaining material isolated in the size fractions obtained at larger elution times was discarded because of its relatively low amount (<3%). Fractions were acidified to pH 2.0 with 1.0-M HCl, and the precipitated humic matter was dialyzed against Milli-Q deionized water in Spectrapore 3 membranes (cut-off 3,500 Da), and freeze-dried. Yields for the six fractions are summarized in Table 1.
aReferred to 50-mg injected RES4. A 400-MHz Bruker Avance spectrometer (Bruker, Billerica, MA, USA), equipped with a 5-mm Bruker BBI (Broad Band inverse) probe, working at the 13C and 1H frequencies of 100.62 and 400.13 MHz, respectively, was employed to conduct all liquid-state NMR measurements at 298 ± 1°K. Each sample (5.0 mg) was dissolved with D2O/NaOD (0.1 M) and placed into 5.0-mm quartz tubes. 1H NMR spectra were acquired with 2 s of thermal equilibrium delay, 90° pulse length ranging within 8.5 and 9.5 μs (−2-dB power attenuation), 32,768 time domain points, and 96 transients. 2D homo- and heteronuclear spectra were acquired with 2,048 points in F2 domain and 256 experiments in F1 dimension. Both 1H-1H correlation spectroscopy (COSY) and total correlation spectroscopy (TOCSY) experiments were executed with 96 scans, 2 s of thermal equilibrium delay, and 16 dummy scans, while, in case of TOCSY, a trim pulse of 2,500 μs and a mixing time of 0.08 s were applied. 1H-13C gradient-enhanced heteronuclear single quantum coherence (HSQC) experiment was performed with a trim pulse of 1 ms and by optimizing experimental parameters as a function of 145-Hz short-range 1JCH. 1H diffusion-ordered spectroscopy (DOSY) NMR spectra were obtained by a stimulated echo pulse sequence with bipolar gradients, combined with two spoil gradients and an eddy current delay before signal acquisition. This sequence was selected to reduce signal loss due to short spin-spin relaxation times. The acquisition (8-K points) consisted in 512 scans and was executed by using a 2.5-ms long sine-shaped gradients (δ) that linearly ranged from 0.674 to 32.030 G cm−1 in 32 increments and selecting a 150-ms delay (Δ) between the encoding and the decoding gradients. In all cases, the 1H and 13C spectral widths were 13 (5,201.7 Hz) and 250 ppm (30,186.1 Hz), respectively. In order to suppress the residual water signal, the on-resonance presaturation technique was adopted for 1H spectra and homonuclear 2D experiments, whereas a Watergate 3-9-19 pulsed train sequence was preferred in case of DOSY experiments. All spectra were baseline corrected and processed with Bruker Topspin Software (v.2.1). The free induction decays (FIDs) resulting from 1H 1D and DOSY 2D spectra were apodized by multiplying by 1- and 5-Hz exponential factors, respectively. The distorted signal resulting from water suppression was removed in 1D spectra by applying an on-resonance Qfil algorithmic function during Fourier transform. 1H NMR spectra of RES4 and the six size fractions (F1 to F6) are shown in Figure 1. The spectrum of the bulk RES4 (Figure 1A) reveals broad and overlapped signals. This broadening of proton signal is due to intermolecular associations which, combined with the relatively high viscosity of humic solution, hinder the mobility of molecular components and consequently reduce T2 spin-spin relaxation times . Signals resonating in the region 0.5 to 4.5 ppm can be associated to alkyl, aminoalkyl, and hydroxyalkyl protons, while those signals detected between 5 and 9 ppm correspond to olefinic and aromatic protons. Signals attributable to CH-C-X (X: electron-withdrawing group) systems are detected in the 1.9- to 3.0-ppm interval, and those attributed to CH-X (X: heteroatom) groups are detected, though less abundantly, in the range between 3.0 and 4.5 ppm (Figure 1A). Similar results had been recently observed by solid-state 13C-CPMAS NMR spectroscopy for the same bulk RES4 that revealed a lower intensity in the hydroxyalkyl (50 to 90 ppm) carbon region , following the selective Humeomic step-wise chemical fractionation of a humic matter. 1 H NMR spectra of RES4 (A) and its six size fractions separated by HPSEC F1 to F6 (B to G). Colored rectangles differentiate sets of proton from different functional groups, assigned as follows: aromatic (dark green); olefinic (blue); CHn-X where X = O/N (light green); Alkyl CHn (orange); highly shielded alkyl CHn (purple). A lesser extent of overlapping of proton signals was noted in spectra of size fractions (Figure 1B-G) in respect to RES4. In these spectra, most peaks appeared narrower and more pronounced than in the bulk RES4, due to the decreased molecular heterogeneity of size fractions as a result of the HPSEC separation. In particular, more intense and abundant signals were visible in the hydroxyalkyl region (3 to 5.2 ppm), which suggested the presence of hydroxy- or aminoalkyl protons CH-X (X: O/N) in the 1.50- to 2.50-ppm region next to sp2 carbons, such as double bonds or carboxyl groups. In contrast with RES4, all size fractions revealed intense signals for alkyl protons (0.7 to 1.4 ppm), to be ascribed to methylene chains or CH2 groups in various lipid compounds, such as plant waxes and polyesters. In agreement with previous results , the abundance of these groups in all size fractions indicates their role in the recalcitrance of humic supramolecular associations. It is noteworthy that the presence in all size fractions of several signals is resonating at around 0 ppm, possibly related to highly shielded protons, such as those close to electron dense metals. Only in the case of the F5 size fraction, three significantly intense signals at 8.42, 7.78, and 7.36 ppm were detected (Figure 1F). The first two resonate at significantly greater chemical shift than for aromatic protons, thereby suggesting strong deshielding effects probably due to electron-withdrawing ring substituents or condensed ring structures. The visibility of these signals in size-fraction spectra is to be accounted to either their undetectability under more intense resonance in the bulk RES4 or to the conformational simplification in size fractions brought about by the HPSEC separation. In fact, it has been already shown that size exclusion chromatography affects the architecture of humic supramolecular associations  by rearranging heterogeneous molecules into less complex assemblies and enhancing their analytical visibility. This effect was already noted for the fractions obtained by applying the Humeomic procedure to size fractions separated by HPSEC from a bulk HA . As in the case of the NMR spectra of size fractions reported here, the previously reported analytical larger visibility of molecular components in less complex size fractions in respect to bulk HA was a consequence of the weaker intermolecular associations obtained after HPSEC separation. 2D NMR experiments, such as COSY, TOCSY, and HSQC, are useful tools for the identification of the molecular components in humic matter that would be hard to single out by only 1D spectra. COSY and HSQC spectra for the bulk RES4 are reported in Figure 2. The relatively low number of correlations detected in these 2D spectra reflects the poor signal visibility in the 1D 1H spectrum of this material (Figure 1A). Nevertheless, a significant correlation between hydroxyalkyl and alkyl protons may account for a large presence of hydroxylated compounds. This appears to be conformed by the most intense signals detected in HSQC spectrum for the alkyl (20 to 40 ppm) (Figure 2C) and hydroxyalkyl (60 to 70 ppm) (Figure 2C) carbon regions. As for the aromatic protons (6.5 to 8.5 ppm), the 1H spectrum of RES4 (Figure 1A) showed only a very broad poorly intense resonance, whereas COSY (Figure 2B) revealed two neat proton cross peaks, representing the most abundant aromatic components in the sample. Although these cross peaks (6.52 to 6.88 ppm and 7.23 to 6.21 ppm) were not related to each other, as implied by the lack of cross correlation in COSY (Figure 2B) and TOCSY (data not shown) spectra, their chemical shifts suggest a similarity due to electron-donating substituent (such as −OH, −OCH3, or OR) in the aromatic ring. Contrary to 1D and 2D COSY spectra, no clear aromatic signals were detected by HSQC experiments (Figure 2C), mainly because of the noted broadening of aromatic resonances. A reason for this may well reside in the strong intermolecular associations occurring among aromatic molecules and in the consequent shorter T2 relaxation times for both 1H and 13C nuclei. 1 H- 1 H COSY and 1 H- 13 C HSQC spectra of RES4. 1H-1H COSY (A, aliphatic and hydroxyalkyl region; B, aromatic region) and 1H-13C HSQC (C) spectra of RES4. Rectangular regions in HSQC correspond to the following sets of proton signals: Alkyl CHn (1); CHC = O (2); CHn-X where X = electron-withdrawing group (3). 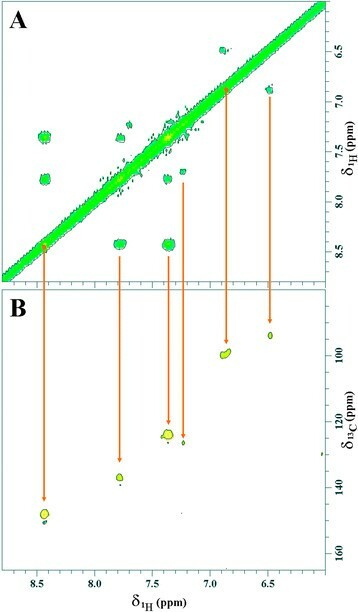 In line with observations in all proton spectra (Figure 1), 2D NMR of size fractions confirmed a relevant similarity among the six size fractions, except for the few intense aromatic signals in the F5 size fraction (Figure 1F). The most intense and resolved signals detected by COSY (Figure 3A,B) and HSQC (Figure 3C) spectra in the F1 size fraction were also visible in spectra of all other size fractions, except for the F5 sample which revealed a larger number of signals. Due to these similarities, only the 2D spectra of the first F1 size fraction are reported here (Figure 3A-C). 1 H- 1 H COSY and 1 H- 13 C HSQC spectra of the F1 size fraction separated from RES4 by HPSEC. 1H-1H COSY (A, aliphatic and hydroxyalkyl region; B, aromatic region) and 1H-13C HSQC (C) spectra of the F1 size-fraction separated from RES4 by HPSEC. Rectangular regions (1 to 4) in HSQC correspond to the following sets of proton signals: Alkyl CHn (1); CHC = O (2); CHn-X where X = electron-withdrawing group (3); CHn-C = C (4). Most of 2D signals observed in the size fractions have been already noted for RES4, although size fractions produced more homo- and heterocorrelations than for the bulk RES4. This further confirms that the HPSEC separation provided simpler humic material and, consequently, less signal overlapping in size fractions. Again, several correlations, equally detected in all size fractions, predominantly involved hydroxyalkyl and alkyl protons. These signals may be attributed to hydrophobic chains deriving from different types of lipid structures, including unsaturated, mono- or polyhydroxylated chains. In particular, the most intense signal at 1.19 ppm was bound to a carbon resonating at 29.1 ppm, as revealed by HSQC (Figure 3C), and, being within a methylene proton population, it implies the presence of a hydrophobic backbone of carbon chains. In COSY spectrum (Figure 3A), the 1.19-ppm signal is correlated with the terminal methyl at 0.78 ppm that, in the HSQC spectrum, is also correlated to 13C at 13.65 ppm (Figure 3C). The presence of unsaturated lipids is also suggested by the signal at 5.21 ppm (13C δ = 129.3 ppm, Figure 3C), attributable to protons bound to sp2 carbons, and, in turn, correlated to −CH2 protons at 1.91 ppm (13C δ = 26.99 ppm, Figure 3C). The relatively low field for these signals is due to a deshielding resulting from the adjacent double bond. The fact that these protons are also vicinally coupled to the signal at 1.18 ppm (methylene chains) strongly agrees with the assignment. The resonance at 1.18 ppm also correlates with a signal at 1.47 ppm (13C δ = 25.13 ppm, Figure 3C) that is in turn related to another signal at 2.15 ppm (13C δ = 33.33 ppm, Figure 3C). These signals correspond to β and α methylenes in fatty acids, respectively, whose different chemical shift varies according to the distance from a carboxyl group. The COSY spectra also reveal correlations between protons resonating at 3.98 and 4.19 ppm, which may be attributed to glycerol protons in lipids. The presence of mono- and polyhydroxylation is implied by the remaining intense correlations between the alkyl (1.1 to 1.4 ppm) and hydroxyalkyl (3.05 to 4.21 ppm) regions in COSY (Figure 3A). In fact, as suggested by HSQC in Figure 3C, such protons are adjacent to hydroxyallyl carbons resonating between 60 and 70 ppm (Figure 3C). The hypothesis that such proton and carbon frequencies could indicate possible carbohydrates structures had to be discarded, as a result of the lack of anomeric protons in 1D spectra. Moreover, the extensive treatment by hydroiodic acid in the last step of the Humeomic procedure must have resulted in cleavage of glycosidic bond. However, no typical spin systems for saccharide-like structures were detected in TOCSY spectra for the F1 size fraction (data not shown), thereby failing to substantiate their presence. Finally, the signals that differentiate F5 from the other size fractions are resonated in the aromatic regions of both TOCSY and HSQC spectra (Figure 4). These signals at 7.3, 7.8, and 8.4 ppm (Figure 1F) were bound to carbon signals at 124, 136, and 149 ppm, respectively, as revealed by HSQC (Figure 4B). TOCSY experiment indicated that all of such peaks are part of the same spin system, whereas their deshielded chemical shifts implied the presence of an electron-withdrawing group in the substitution pattern, such as a carboxyl group. However, both COSY (Figure 4A) and TOCSY experiments (data not shown) revealed also two correlations at 7.2 and 7.7 ppm, which are evidence for aromatic rings with electron-donating substituents. Aromatic region of 1 H- 1 H TOCSY and 1 H- 13 C HSQC 2D NMR spectra. Aromatic region of 1H-1H TOCSY (A) and 1H-13C HSQC (B) 2D NMR spectra of size fraction sample F5. 1H diffusion-ordered spectroscopy (DOSY) is a pulsed field gradient technique that enables measurement of translational diffusion of dissolved molecules and mixtures. It produces a final 2D spectral output in which each chemical shift is directly correlated to the translational diffusivity of either a single molecule or the aggregate to which the molecule is associated ,. According to the Einstein-Stock diffusion theory, the larger the hydrodynamic radius of a molecular complex, the smaller is the related diffusivity . Diffusion coefficients resulting from DOSY NMR experiments may thus provide direct information on intermolecular interactions, state of aggregation, and conformational changes in complex mixtures -. Table 2 reports the 1H diffusion coefficients calculated for signals in the alkyl (2 to 0.5 ppm), hydroxyalkyl (4.4 to 2.5 ppm), and aromatic (9 to 6.5 ppm) spectral regions, while 2D DOSY spectra are shown in Figure 5A-G. All RES4 protons resulted substantially aligned to the same diffusivity, since all their projections were located in a restricted logD range between −10.2 and −10.4 m2 s−1 (Figure 5A). Alkyl protons resonating in the 1.1- to 0.6-ppm interval showed a small difference in respect to their projections, since they were placed in a slightly upper position (Figure 5A). These substantial similarities among the various RES4 molecular domains reflected the large sample homogeneity prior to HPSEC chromatography. In the center of aromatic region, protons with chemical shift between 7.0 and 8.0 ppm (Figure 5A) displayed slightly greater diffusivity than those outside of this range. Interestingly, DOSY spectra of the fractionated RES4 of this study differed significantly from those reported in literature for bulk humic substances from oak and pine forest soil humic substances , which showed different values of diffusivity for aromatic, hydroxyalkyl, and alkyl protons. aThe reported value was obtained by excluding the contribute of signals at 7.3, 7.8, and 8.4 ppm, for which the average diffusion value resulted to 9.0. 1 H-DOSY NMR spectra of sample RES4 (A) and size fractions F1 to F6 (B-G). In left columns, proton projections for four different diffusivity values are shown (different magnification orders were applied). Conversely, diffusion coefficients for the size fractions differed from those for the bulk RES4 (Table 2), confirming the profound changes in conformational structure induced by HPSEC separation which were already suggested by 1D spectra (Figure 1). In particular, the diffusivity for alkyl protons showed a reducing trend with decreasing fraction size, whereas that for hydroxyalkyl and aromatic protons invariably increased (Table 2). In fact, in comparison to RES4, the diffusivity values for alkyl protons were relevantly decreased for F1 and even more so for F2 and F3. For the lowest size fractions, diffusivity remained small and in the range between 2.5 and 2.9 · 10−11 m2 s−1 (Table 2), especially for the most shielded alkyl signals in both RES4 and size fractions (Figure 5B-G). In the case of hydroxyalkyl and aromatic protons, the diffusion coefficients increased progressively with decreasing size of fractions (Table 2). A gradual increase of diffusivity was observed from RES4 to F3 sample (Figure 5A-D), followed by its decrease for F4 and F5 size fractions (Figure 5E,F), and a subsequent significant increase in last F6 size fraction (Figure 5G). This is also noticeable by the enhanced downward displacement of proton projections for both hydroxyalkyl (Figure 5) and aromatic (Figure 5) regions. These variations can again be explained with an increasing molecular and conformational changes in the smaller size fractions obtained during the HPSEC separation. In fact, not only lower molecular size in the smaller F6 size fraction justifies an enhanced proton diffusivity, but also the larger amount of hydrophilic molecules in F6 may limit further aggregation size and, thus, diffusivity. In fact, hydroxylated alkyl chains were also evident in DOSY spectra (Figure 5G), in which the projection of several alkyl protons, resonating at 1.35, 1.6, 2.1, and 2.3 ppm, were placed relatively downward (greater diffusivity) than lipid signals. It may thus be inferred that the F6 size fraction contained two populations of aggregates: the larger aggregates made of lipid components and the smaller ones constituted mainly by hydrophilic components. The presence of both kinds of small associated compounds in the same size fraction is consistent with its small nominal molecular size. On the other hand, the diffusivity observed for hydroxyalkyl and aromatic protons in F4 and F5 (Figure 5E,F) samples may be the result of an increased supramolecular association due to aromatic interactions, driven by π-π stacking forces and/or H bondings among complementary hydroxyl groups. 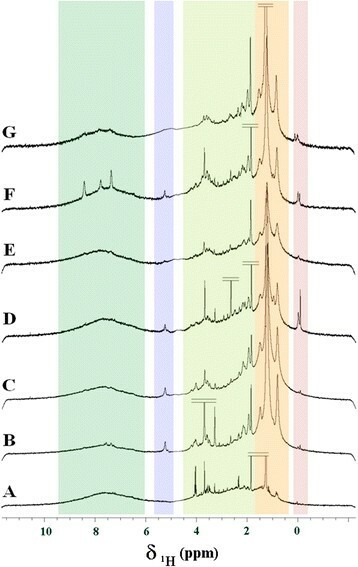 Furthermore, as mentioned before, the aromatic region in F5 sample showed three different signals (Figures 1 and 4) whose averaged diffusion coefficient (9 · 10−11 m2 s−1) was significantly greater than the one for the remaining aromatic protons (5.2 · 10−11 m2 s−1) (Table 2). This suggests evidence for two coexisting states for aromatic compounds in this size fraction, being held by intermolecular interactions of different strength. The end product (RES4) of a step-wise Humeomic fractionation procedure applied to a humic acid from soil was successfully solubilized in alkaline solution and then separated by preparative HPSEC to provide six size fractions. High-resolution solution-state NMR spectroscopy was applied to the size fractions in order to evaluate the enhanced characterization capacity of NMR due to the size simplification provided by HPSEC separation. We confirmed that HPSEC is capable of reducing the complexity of a recalcitrant humic matrix, thereby consequently decreasing the overlapping of NMR signals and improving spectral quality and, hence, signal assignment. 1D spectra revealed that, even size fractions were not significantly different from each other, all of them differed from the bulk RES4, as the alkyl signals, assigned to lipid structures by 2D NMR spectra, were more intense and resolved. This suggests that the apparent lack of such signals in RES4 is not due to their absence but rather to their strong intermolecular associations which favor very short T2 relaxation times and such a signal broadening to impair detectability. The aggregation of humic molecules in the bulk RES4 was weakened by the HPSEC separation, thereby allowing less tight molecular associations in the hydrophobic domains of the recalcitrant end product of Humeomics. The low proton diffusivity in the alkyl region of size fractions, as shown by DOSY NMR spectra, suggests that lipid components do re-aggregate, after HPSEC separation, in newly stable superstructures. Conversely, the diffusivity for aromatic and hydroxyalkyl protons increased with decreasing size of fractions, thus indicating a molecular stabilization of molecular assemblies though H bondings and aromatic π-stacking forces. The smallest F6 size fraction showed a significantly enhanced diffusivity for these same protons that may be explained with small assemblies squeezed out from larger associations. This work contributed to the NMR characterization of a recalcitrant end result of a Humeomic procedure applied to a terrestrial humic acid. The enhanced resolution of NMR spectra was achieved by subjecting the recalcitrant residue to a preliminary HPSEC separation in smaller size fractions, thereby confirming that an improved characterization of humic molecules can only be achieved if they are reasonably separated from the complex humic matrix. The present work was carried out in partial fulfillment of AN, PM, and DS’s PhD degrees funded by the host institution ‘Università degli Studi di Napoli Federico II’. The experiment was conducted under the general supervision of AN. Taking equal parts, AN, DS, and PM carried out: sample preparation, Humeomic fractionation, HPSEC size fractionation, and NMR experiments. AN and PM interpreted the NMR spectra. The manuscript was written by AN. All authors read and approved the final manuscript.